Mar 29 Comments Off on Oil Pulling | What you need to know! Oil pulling seems to be one of the biggest crazes to hit the market. Not sure what it is or never heard of it? Read on to find out more. Here at Camden Place, Preston, we urge all our patients to seek medical advice when planning on trying out this method. Oil pulling is not recommended as a substitute to regular oral hygiene practice. Oil Pulling – What exactly is it? Oil pulling is the procedure of rinsing/swilling your mouth with oil, pulling it through the teeth. 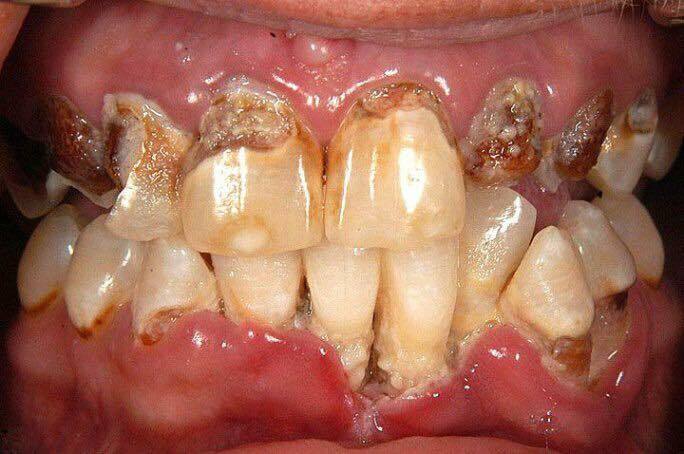 As the oil washes past your teeth and gums it supposedly picks up the microbes present, acting as almost a magnet for the bacteria. It is an ancient, traditional folk remedy that has been used for centuries in Southern Asia and India. Most people using oil pulling techniques use a tablespoon of edible sesame, sunflower, olive or coconut oil. Coconut oil is the preferred oil as 50% of the fat it contains is comprised of lauric acid. What are the effects of oil pulling? In the current reports on the health benefits there has been little medical evidence in the surrounding research which doesn’t have clear limitations. Scientific studies have not provided the clinical evidence to show that oil pulling does reduce cavities, whiten teeth or improve the mouths overall hygiene. There have been some instances where users have experienced an irritated stomach and diarrhoea. Owing to this we recommend that patients visit their dentist in order to be fully aware of the best treatments available for them and their mouths. At Camden Place, Preston, we offer dental hygienist services, teeth whitening treatments and propose regular check-ups for our patients in order to maintain their oral health. As stated, we recommend that patients do not use oil pulling as a substitute for their regular dental hygiene routines. To arrange an appointment for your free consultation please contact us, or call 01772 556 050. Cosmetic treatments are some of the best ways for patients to achieve their dream smile. There are lots of different treatments on the market depending on what you are looking for and what you would like your end result to look like. Smile Makeover – a customised multidisciplinary approach using a combination of some of the following treatments to improve your smile and overall facial profile. Cosmetic Veneers – one of the most popular treatments we offer, they are custom-made shells which are designed to cover the front surface of the teeth to improve their appearance. Emax Crowns – a tooth-shaped cap to cover the tooth, can help to restore size, shape, strength and the appearance of the tooth. Teeth Whitening – to brighten and help white teeth that have been stained over time. Invisalign Braces – a clear and less obvious form of braces which helps move the teeth into position using a serious of different braces which can be removed and changed with the progression of the teeth. Laser gum contouring – to remove excess gum that could be making your teeth appear smaller, as part of our Smile Makeover. Why would you have these treatments? If you are not happy with the appearance of your teeth and are looking for a way to achieve that perfect smile, then cosmetic treatments are the best way of resolving the issue. Consulting with your dentist about the possible options for your teeth will be the best place to start with when embarking on your journey to that desired smile. They will be able to discuss with you, in detail, the various treatments available and what would work best for your desired smile result. If you’d like to find out more information about the cosmetic treatments we offer at Camden Place, Preston, or you’d like to book your free consultation then please do not hesitate to get in touch with our friendly and professional team. You can contact us or call 01772 556 050, we look forward to hearing from you! Dental implants are a simple process, if you are interested in having the procedure or have been recommended to have dental implant surgery the first step is to arrange a free consultation, where one of our dentists will meet with you to discuss the treatment. You will more than likely have to have an oral examination, which will include x-rays of the mouth, to determine whether your mouth is suitable to have the procedure. The dentist will then advise you on what treatment will be best for you, visual aids may also be used to explain this. The dental implant procedure itself will be carried out by a dental implant expert who has the right training, skills and experience to assess your situation and custom design a bespoke treatment plan for you. Dr Hamza Sheikh is Camden Place’s resident dental implant dentist and will be the dentist performing the procedure. Within your treatment plan you will be given an estimated time for the completion process. This will differ from patient to patient based on their restoration needs, medical and dental histories, the condition on the jaw bone and the material needed. To ensure that your dental implants stay for the long-term, remain sturdy and function like your natural teeth, multiple appointments will be necessary. Dental implants can last a lifetime with the right aftercare. Once the final restoration is fitted an appointment is usually scheduled with our dental hygienist, Justine Eastwood, who will discuss with you the best way to keep your mouth happy and healthy to help you maintain your new dental implant. We would always advise that you book in regular check-ups with your dentist to check your teeth and mouth are healthy. This is especially true with those who have received dental implant surgery. Every year patients will have their mouths x-rayed to check the bone levels in the jaw. If there has been bone loss then the dentist will show the patient the x-ray, explain the results and issues, and discuss a new treatment plan with the patient. Making sure you take care of your new dental implants and your oral health can make all the difference in their success. To arrange your free consultation, or if you have any questions, please contact us, or call 01772 556 050. Dentures are removable false teeth which can be made from acrylic, metal or nylon. 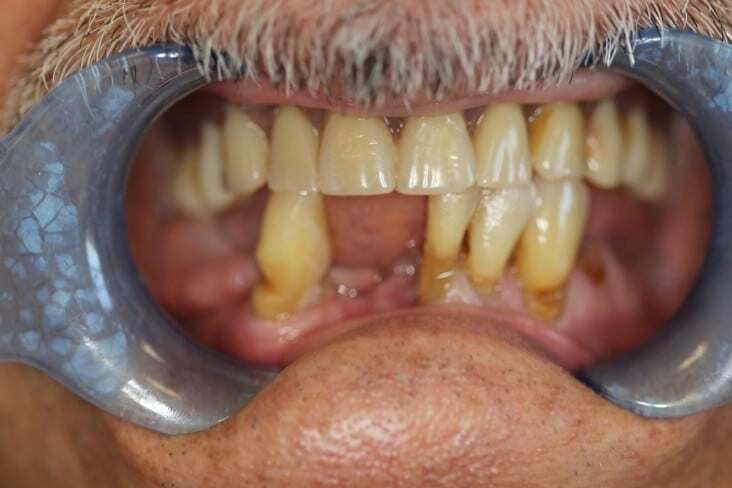 They are made to fit over the gums to replace any missing teeth within the mouth and prevent issues which can be caused by the gaps, which can affect things such as a persons bite, their gums and even their confidence due to the appearance of a ‘gappy’ mouth. 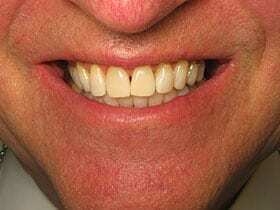 Partial dentures – to replace just one or a few missing teeth in the mouth. Complete dentures – a full set of dentures to replace all your upper or lower teeth in the mouth. In society there has been known to be a slight stigma associated with having a denture or dentures, and we would always advise to have dental implants over this due to the potential problem of retention caused by shrinkage of the gums. There is the possibility to reduce the health and strength of the existing teeth through the use of a denture. However, they are a fantastic way of helping with the issue, but they do not provide a resolution for those trying to solve the issue entirely. Dentures – Why Have Them? Dentures are just on of the treatments available to help to prevent problems associated with gaps in the teeth such as eating and speech issues. Dentures can also help to improve the overall appearance of the mouth, acting as a cosmetic treatment as well, making the mouth have an enhanced cosmetic look. This can not only help improve the health of the mouth overall, but it can also give those people wearing the denture confidence to not hide their mouths and their smiles. This treatment will also help patients to be able to eat and chew a number of foods. We at Camden Place can arrange for a free denture consultation at our Preston city centre clinic to discuss this option with you. You are lacking bone in the mouth or jaw, of which would cause your denture to be loose or unstable in the mouth. You have a strong gag reflex, which could be triggered or aggravated by using a denture. You have decaying teeth, which are on the verge of falling out, meaning your denture could be unstable and would put pressure on them. You have gum disease and it is affecting all your teeth. 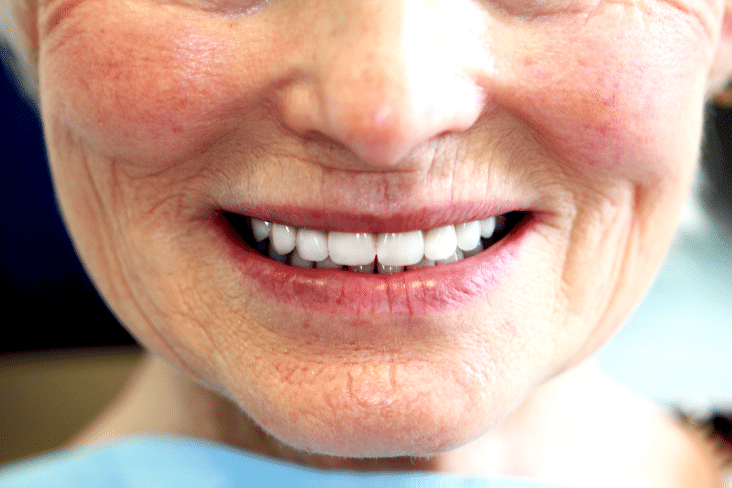 You have previously worn a denture and have diminished oral sensation because of it’s use. You do not want to wear a denture due to the cosmetic impact it could have, and general stigma about having dentures. Patients who already wear a denture, or have dentures, who need some stability to their denture can opt to have dental implants placed instead or as well as the denture, which will provide the denture with much needed retention. However, there is also the option for patients to replace a denture entirely. If you have any questions regarding dental implants, full or partial dentures or anything else then please do not hesitate to get in touch with our friendly and professional team at Camden Place Dental Practice, Preston. You can book your FREE consultation with our dental implant dentist by calling 01772 556 050. Mouth cancer is not something you hear about as regularly in comparison to other cancers, such as breast cancer and skin cancer. But, mouth cancer is equally as common and equally as dangerous. Mouth cancer, or oral cancer, can affect the lips, tongue, cheek and throat, and it can affect anyone. In general, oral cancer is more common in those over the age of 40 and in particular men, but there are increasing numbers of the disease affecting younger patients and more women. It is important to note that even though mouth cancer is not as widely heard of it is still a very serious disease and can cause death if not diagnosed and treated early enough. Therefore, visiting your dental practice is so important. Those with oral cancer have a higher chance of dying than those with melanoma skin cancer or cervical cancer. Tobacco use – cigarettes, cigars, pipe smoking and other traditional forms of tobacco use including chewing tobacco. Sun exposure – when done excessively this can increase the risk of cancer of the lips. Mouth ulcers that do not heal within several weeks. Lumps within the mouth that are unexplained and will not go. Lumps in the neck which are unexplained and will not go. Numbness on the lips or tongue which is unexplained. Looseness of teeth or sockets that do not heal after extractions. White or red patches in the mouth lining or tongue. Changes in speech, such as a lisp. Mouth cancer can be spotted in its early stages by your dentist during a mouth examination, that’s why it is important to visit your dentist on a regular basis when they recommend an appointment. There are a couple of ways to treat mouth cancer including surgery to remove any cancerous cells, radiotherapy and chemotherapy. If you are concerned about mouth cancer or are worried you may be suffering from the symptoms of mouth cancer and want to book an appointment at Camden Place Preston, then please contact us or call us on 01772 556 050 to speak to our team. Nervous patients are something we here at Camden Place Preston see on a very regular basis. It’s so common in fact that one in four people dread visiting the dentist. There are varying degrees of fear involving the dentist, and it can be caused by different things for different people. The thought of a treatment hurting or the smell of the dentist can trigger fear. However, there are ways in which we can help and some simple things you can do if you are a nervous patient and suffer from a fear of the dentist. Many people fear the dentist due to bad memories from childhood, but the development of modern dental practices who have created a friendlier environment, and polite and helpful staff are just one of the ways dentists are making visiting them a less stressful experience. Advancements in dentistry and technology also mean that treatments are often completely painless. Numbing gels and even computerised injection systems have all been developed to help ease patient’s minds and give them a more relaxed experience if they are uncomfortable with visiting the dentist and must receive treatments which could cause pain. Here at Camden Place Preston our dentists, dental nurses, hygienists and other staff are all trained to be understanding of your fears and give you the support and take the necessary measures for you to feel comfortable and relaxed. We can also offer intravenous sedation for those who have an extreme phobia and are very anxious visiting the dentist. This can also benefit you if you have a sensitive gag reflex or have difficulty sitting in a dental chair for extended periods of time. 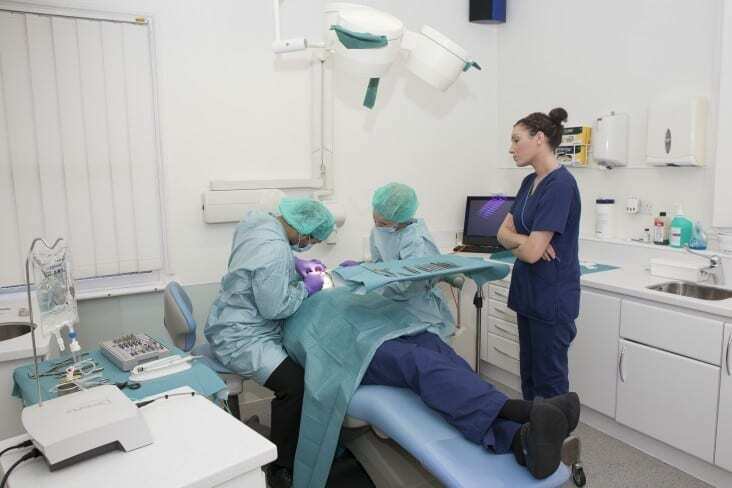 IV sedation, together with the numbing effect of local anaesthetic, can be used to carry out any treatment, whether implant related or general dentistry and is a great way for nervous patients to relax whilst at the practice. Saving time and inexpensive – due to fewer appointments! If you’re a nervous patient and are interested in discussing a dental issue, want more information about how we can help you with your fear or just have a general question then please contact us, or call 01772 556 050 to arrange a consultation at Camden Place, Preston. Tooth pain and toothache are both pain in and around the teeth and jaws that is usually caused by tooth decay. Firstly, if you are experiencing any toothache or pain in the mouth and it has been more than one or two days then please contact your dentist or contact us here. The longer you leave it, the worse it will get and problems such as dental abscesses can occur if untreated. Toothache can be felt in many ways, it can be sporadic or it can be a constant pain. In terms of the amount of pain, this can vary from being fairly mild to quite severe, and it may feel sharp and start abruptly. There are also things that can increase the pain, laying down can sometime aggravate the pain, so at night this can cause a lot of discomfort, and eating and drinking can also increase the pain, especially when they are hot or cold. There are several things that can cause toothache and pain in the mouth. Lost fillings, broken teeth, receding gums and tooth decay are usually the issues which start the pain. Locating the source of the pain can also be hard. It can sometimes be difficult to determine whether the pain is coming from the upper or lower teeth or jaw, and the pain can even feel like it’s coming from the ear (lower molar infection), sinuses, the cavities behind your cheekbones and even your forehead (all from pain in the upper teeth). How is tooth pain treated? This will be dependent on the type of tooth pain and what is causing the issue. At Camden Place our dentists will ask you to come into the Preston practice and examine your mouth; an x-ray may also be done to identify the problem. Tooth decay – the decayed area will be removed and replaced with a filling. Broken filling – the filling will be removed and replaced with a new filling. Pulp inside your tooth is infected – root canal treatment. Impacted tooth – the tooth will be removed. This is fairly simple, if done correctly! The best way to avoid getting toothache and tooth pain is to keep your teeth, gums and mouth healthy. Check out our previous blog posts for how to maintain a happy and healthy mouth. If you require more information, want to become a new patient at Camden Place Dental Practice, want to have a chat regarding our service or have any other queries then please feel free to contact us on01772 556 050 or click here. Jan 23 Comments Off on Teeth Whitening: Dos and Don’ts! Teeth Whitening: Dos and Don’ts! Teeth whitening is just one of the ways for us to achieve the perfect smile that we have always wanted. But, with many high-street alternatives now on the market, people are lightening their teeth outside of the dental practice and in their own homes; sometimes with little to no results, sadly. Research professional teeth whitening treatments. There are numerous teeth whitening options available on the market but the safest and most effective will be those you can get from your dentist. Contact us to get more information about which option would be best for you and we can book you in for your free consultation at our Preston clinic. Eat vegetables! As much as you may not like them, they are not only good for your body, they’re also good for your mouth. Crunchy veg is particularly great for your teeth, it helps to remove stains from the surface to help create a whiter smile. Maintain your dental hygiene. Brush and floss your teeth twice a day, as well as visit your dentist regularly. This helps to remove most of the food and drink residues that stain your teeth. Your dentist or dental hygienist will help you maintain a healthy mouth and can even give your teeth a polish for an instant result. If you’re interested in what teeth whitening treatments we have available click here. You can even book in to see our resident dental hygienist Justine! Use a tooth whitening product you’re not sure about. Not everything out there will be good for you and your teeth, some may be too harsh or completely useless, and if you are concerned with keeping a happy and healthy mouth then the risk is not worth it. Instead, consult with your dentist, they will be able to make a recommendation based on your situation and provide you with the necessary treatment to achieve your goals. Eat food that will stain your teeth. Obviously, this cannot always be avoided, but reducing the amount of coffee, red wine, chocolate and smoking will help to reduce the staining on your teeth. Acidic food and drinks, like sugary snacks, can erode the tooth’s enamel, making it easier for food such as these to stain the teeth. Overdo it. Teeth that are too white look unnatural and will look very stark and obvious to others. Also, the ingredients in teeth whitening products, when over-used, can alter the structure of the teeth, making them very sensitive, particularly to hot and cold foods. If you’re interested in having your teeth whitened, or are just interested in having a discussion about the procedures available and what will be best for you then please contact us, or call 01772 556 050, to arrange your free consultation at Camden Place, Preston. Jan 16 Comments Off on Dental Hygienist | Why you should see one! Dental Hygienist | Why you should see one! Keeping your mouth happy and healthy not only includes visiting your dentist on a regular basis for check-ups, it also includes other care that a dental hygienist provides. They are an important part of any dental practice and work mainly in preventative treatments and treating gum disease. They can also provide essential advice to patients, ensuring they understand how to correctly look after their teeth at home. Visiting a dental hygienist could mean that you could be receiving one or several treatments. Professional teeth clean or a scale and polish, as it is sometimes called, where they remove the build-up of both plaque and tarter from the teeth. Dental x-rays, to aid diagnosis. Apply fluoride varnish and administer other fluoride treatments. It is recommended that patients visit a dental hygienist where available to make sure their teeth are being well maintained and that their mouth is looking healthy. This not only has the benefit of ensuring your teeth and gums are healthy but will also lead to improvements in your mouth’s appearance and fresher breath. Dental hygienists will also provide patients with recommendations on diet and other ways to prevent tooth decay, gum disease and other associated issues. You may be thinking, why doesn’t the dentist do this? Well, in most cases a dentist can perform all these treatments, but a dental hygienist will be specifically trained to carry out tooth polishes and scaling, and will be able to dedicate more time to your mouth. Justine Eastwood, Camden Place’s resident dental hygienist, has over 10 years of experience looking after the dental health of those within Preston and the North West. She is a member of the British Dental Hygienist Association and regularly keeps up to date with her knowledge and skills in the area. As Camden Place’s dental hygienist, Justine is an integral part of the team and is an asset to the practice. If you have any queries regarding dental hygienist services, or wish to book a free consultation with Justine at our Preston practice then please feel free to contact us or call 01772 556 050.